On the 25th April, Australia and New Zealand will commemorate all those who lost their lives in wars, conflicts and peacekeeping operations. Although Anzac Day honours those who have died throughout the countries' histories, the origins of the commemorations are firmly rooted in the Gallipoli campaign of the First World War. One of the most well-known and extraordinary stories surrounding Gallipoli is that of Alec Campbell. 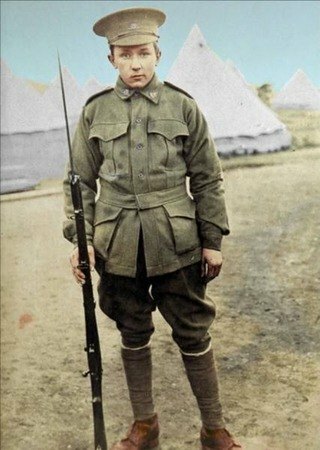 Falsifying his age and enlisting in the Australian army when he was just 16, this young boy from Tasmania wanted to do everything he could to help in the war. He had the important jobs of carrying water and supplies, communicating messages and standing guard. Alec saw many of his friends killed and wounded, and was lucky to escape with a relatively minor injury, suffering a blow to the head when a fellow soldier’s rifle struck him as the soldier was shot. Eventually Alec did become very ill, and was sent home in 1916 after the evacuation of Gallipoli had taken place. He became a war veteran at just 17 years old. What followed was a life lived to the full. Alec worked in all sorts of professions, from wagon building to charity work. He gained an economics degree, became a Tasmanian flyweight champion, and competed in six Sydney to Hobart boat races. He remained extremely active right until the end of his life, and was even driving until he was 95. Alec became the last remaining Anzac in 2001, and it is thought that he was the last soldier left worldwide to be part of the Gallipoli campaign. He died from pneumonia on the 16th May 2002 at the age of 103. 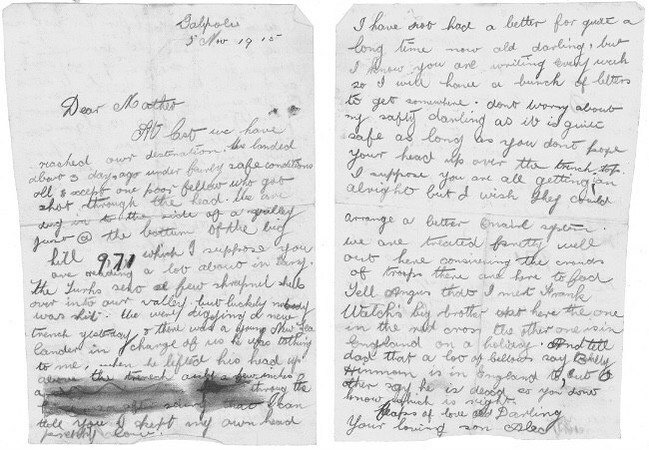 Below is a letter that Alec Campbell wrote to his mother upon arriving in Gallipoli. It is a fascinating insight into everyday life as an Anzac, and a snapshot of the world at this pivotal moment in history. 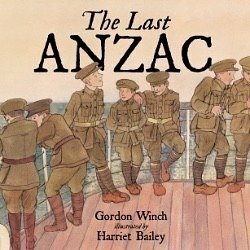 In 2015 New Frontier published The Last Anzac by Gordon Winch, illustrated by Harriet Bailey. It tells the true story of a young boy who goes to meet the 102-year-old Alec at his home in Hobart. To order a copy of the book, please follow the link below. To James, Alec Campbell was a hero. The last living Anzac, and all the Australian and New Zealand soldiers who fought at Gallipoli, were heroes, everyone's heroes. Alec, who died in May 2002 at the age of 103, enlisted in 1915 when he was sixteen. He had put his age up to eighteen in order to be accepted by the army and to fight at the front, wherever he was needed. James travels to meet Alec, and gives us a special view of this humble and remarkable man, the year before he died.